A cozy old farm house for sale in the country? Sabine and Robert think they’ve won the jackpot, when they buy Kreuziger Farm at a reduced rate. But then strange things start to happen: Who is this Marie, with whom only their young son can communicate? Why are there swarms of flies buzzing about? Whose footsteps are those in the attic at night? In desperation, Sabine contacts the “Witch Archive,” a special department at the Ethnological Institute in Hamburg, specializing in the supernatural. But it’s too late. The evil has found its target, and it’s closing in for the kill …PSYCHO THRILL is a series of horror novellas – from classic ghost story to psychological thriller and dark fantasy. Each of the novellas was first published in German and has now been published for the first time in English. Among the writers are popular German authors, as well as newcomers to the scene. Each story is self-contained. PSYCHO THRILL is produced by Uwe Voehl. — For fans of Stephen King: Dark Tower series, Neil Gaiman: Fragile Things, and the American Horror Story TV series. 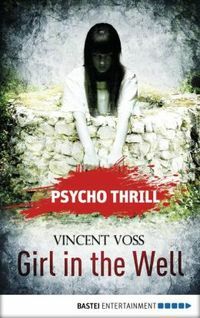 Girl in the Well is a Psycho Thrill horror novella by Vincent Voss. I was told if I liked Stephen King then I would like this, that wasn't a lie. I did enjoy this book, so much that I finished it in a day. It reminded me a lot of the paranormal shows - like The Haunted, A Haunting, Paranormal Witnesses, etc - and those shows have creeped me out in the past. (I'm a wuss.) When I first started reading GITW I kept thinking it was like those scary movies that I loved to watch with one minor difference, I couldn't shut my eyes to the scary parts. It follows Johanna Ebeling and Henning Lambertz, they both work at the Ethnological Institute in the witch archives. It starts with them getting a phone call from Mrs. Falkner stating "I am evil." When she shows up to give her interview to prove that something strange has been happening to her, strange things begin happening in their office. Intrigued Johanna and Henning go to Mrs. Falkners house to further their investigation. The deeper in the investigation they get the more dangerous it is for everyone. Like most paranormal movies and shows it leaves you with more questions that answers. The ending left me craving more.